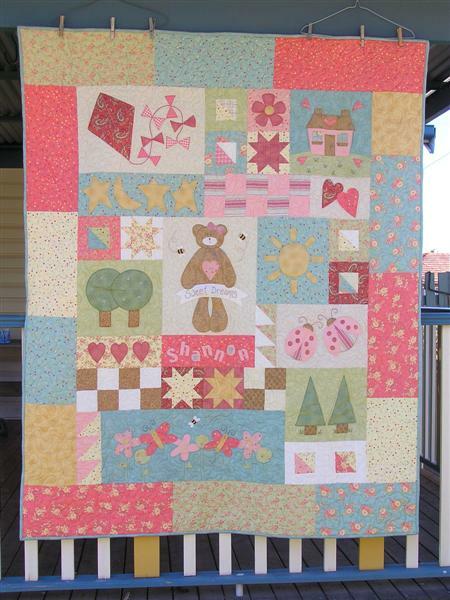 Since i've been a bit slack in the sewing department of late I thought it would be a good time to share a quilt I made about two years ago for my Niece's 1st Birthday. This is a favourite one of mine..... especially due to the fact that it's an original that I made by modifying the "Boys Toys" quilt by Annie of "Hatched and Patched". The fabrics were from the "Poetry Collection" range and the pics really don't do them justice.... Shannon adored her quilt instantly and laid down on it trying to cuddle the teddy bear....too cute! Hard to believe the idea came from here..... a larger version of the "Boys Toys" quilt I made for Master 7 many years ago. This was my first attempt at a quilt with a lot of applique and I've been hooked ever since! I promise to have some sewing to show you after the weekend as I have Club Quilt tomorrow! That teddy is so cute!! Also luv the tie top...have to put that on the to do list for a fast growing Miss 10. The Oldie is a Goodie! Way so cute!!! 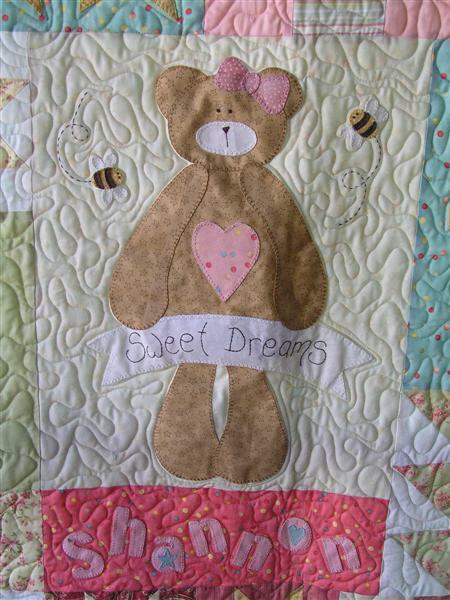 It is a beautiful quilt, the colours are great and the teddy bear is gorgeous.